University Press of Mississippi, 9781496815712, 336pp. This dirt-under-the-fingernails portrait of a small-time farmer follows Zack Killebrew over a single year as he struggles to defend his cotton against such timeless adversaries as weeds, insects, and drought, as well as such twenty-first-century threats as globalization. Over the course of the season, Helferich describes how this singular crop has stamped American history and culture like no other. Then, as Killebrew prepares to harvest his cotton, two hurricanes named Katrina and Rita devastate the Gulf Coast and barrel inland. Killebrew's tale is at once a glimpse into our nation's past, a rich commentary on our present, and a plain-sighted vision of the future of farming in the Mississippi Delta. 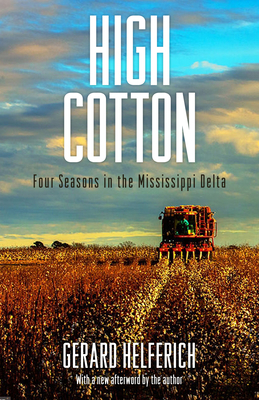 On first publication, High Cotton won the Authors Award from the Mississippi Library Association. This updated edition includes a new afterword, which resumes the story of Zack Killebrew and his family, discusses how cotton farming has continued to change, and shows how the Delta has retained its elemental character.